Northampton Town have signed former Stoke City striker Louis Moult on a one-year deal. The 20-year-old made his professional debut as a substitute in August 2009 and had been on trial at Sixfields. He scored twice in the 2-2 draw with Kettering Town in pre-season. Manager Aidy Boothroyd said: "He's a goalscorer, his touch is good and his movement is excellent. This is a good chance for Louis and it's up to him now to take it." Moult was released by Stoke at the end of last season, having also spent time on loan at Bradford City, Mansfield Town and Accrington Stanley. 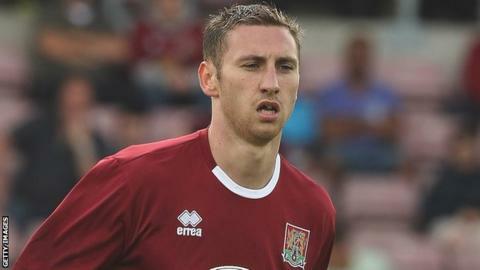 The Cobblers now have Adebayo Akinfenwa, Alex Nicholls, Clive Platt, Henoc Mukendi, Jake Robinson, Lewis Wilson and Moult on the books as forwards. Prior to agreeing a deal with Moult, Boothroyd had told BBC Northampton: "I either look to move one or two out or we play the old fashioned two at the back and seven up front. "I made it a real gameplan to get a strong frontline. Now and again, you get players that you know other people are interested in. "You can't miss an opportunity to get somebody who you know will get you goals, even if they go out on loan and get their wages paid, because in the future they'll be an asset. "He was a fantastic youth prospect at Stoke and, for whatever reason, lost his way. He's nowhere near the end product but he has got that knack of scoring goals."